Solution: The torsional pendulum (wheel) undergoes oscillations in the horizontal plane, such that the angle of rotation, measured from the equilibrium position, is given by theta=.5sin(3t) rad, where t is in seconds. Determine the maximum velocity of point A located at the periphery of the wheel while the pendulum is oscillating. What is the acceleration of point A in terms of t? The torsional pendulum (wheel) undergoes oscillations in the horizontal plane, such that the angle of rotation, measured from the equilibrium position, is given by theta=.5sin(3t) rad, where t is in seconds. 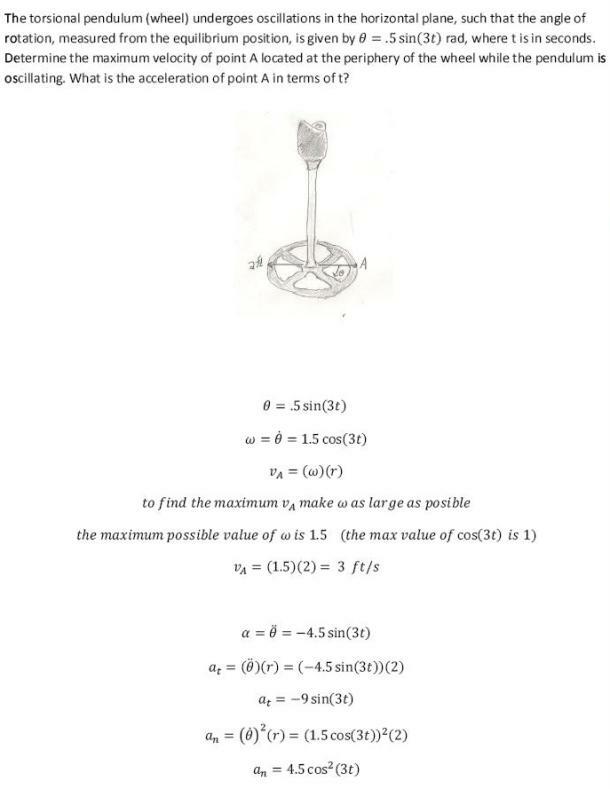 Determine the maximum velocity of point A located at the periphery of the wheel while the pendulum is oscillating. What is the acceleration of point A in terms of t?